The Lyme Disease Citizen Study Committee and its hunt in town are remarkable well organized, as witnessed by its attached minutes. Selectmen recently heard from the Trustees of the Reservations’ ecologist, Russ Hopping, about the beavers, but who also reported that at the TTOR Moose Hill property in Sharon the deer have eaten all hardwoods in the forest so completely that there are now no new hardwoods growing under six feet in height – dramatic changes in that forest. He also confirmed that due to the excessive number of deer over eating our forests, that habitat for ground nesting birds, such as the grouse and woodcock, and the birds themselves, are just disappearing from the area. Restoring balance in our forests is one of the additional benefits of culling the deer by our town hunt. Minutes – reviewed meeting minutes from Apr 29. Frank starting interview process of new hunters. Will need to schedule proficiency testing. October 3 is a new MA kids hunt day. Discussion about additional hunting property. Hospital land issue – large fields on each side of hospital are state owned. Medfield property is only the buildings; Dover owns behind buildings down to the river. Need to work with Dover. Maybe Selectmen can help recruit private properties. Would like to send thank you letter to private property owners, signed by Selectmen. Want to promote TTOR membership to hunters. Only a few showed up for work days. Barry reported 20 deer hit by vehicles in Medfield in 2014, up from 18, per the animal control officer. Chris to print 60 yellow hunting signs and laminate hunting permit tags. Chris will print up more deer management brochures with 2015 date. Chris to draft TY letter to property owners from Selectmen. Frank will ask Selectmen about help with recruiting private properties. Frank and Barry will interview rest of new hunters. Barry will purchase additional stands. Barry will provide updated deer collision/road kill data from Medfield & area towns. Frank to talk to ConComm more about 4H barn and property. Chris will contact Sam Telford to discuss tick study on 4H property. Ongoing during tick seasons: Facebook site posts & Medfield TV 30 second spots. – P&R would like more signs. Frank to drop off. – Met with Susan Cowell to update school curriculum. Have a few items to follow up on. Susan will find out from grade 3 teachers whether value in distributing tick check cards a second time (1st & 3rd graders receive cards currently). Cost is $1.75 ea so budget issue. – NNT never came back with date to speak to members. Chris will follow up in fall. Chris to provide Susan Cowell with updates to curriculum. Chris to follow up with NNT for fall. Chris will confirm late summer with Allie Sahr about joining committee. Spraying fields – Chris reported through Michelle Whelan’s and others’ efforts, Park & Rec erected blue fencing around the edges of the fields at McCarthy Park. Norfolk County Mosquito applied a low volume organic spray at the start of June for mosquitos and ticks. P&R also cut back the brush another 10 feet and put a 3’ mulch barrier behind the fence. Signs are posted on the fence to not go into the area to retrieve balls and that the area is tick habitat. They will continue to keep the grass cut short and enforce the rule of no dogs off leash. P&R is looking into the possibility of tick tubes and deer stakes. 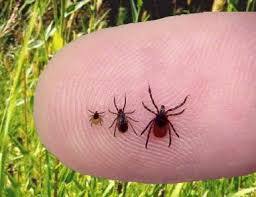 They plan to do tick dragging to measure effectiveness of prevention measures. Hinkley is also part of plans. They plan to meet with Dr. Marsden and try for a similar plan at the Wheelock fields. Chris will follow up with Allie / Michelle again and P&R Kevin Ryder. Budget – Note: Need to submit any expenses by end of June. Buying 3 new stands will use up most of balance of budget.